LITITZ, Penn., April 11 /Christian Newswire/ -- The Pocket Testament League (www.pocketpower.org) has introduced a new free Gospel of John in the ESV (English Standard Version) translation using a cover design oriented towards the construction industry. 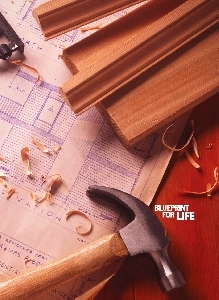 Headlined "Blueprint for Life," the wrap-around cover features the photograph of a blueprint, lumber and tools. One of many different cover designs that make it easy for people to share their faith by giving away a free gift, the new layout was especially created for sharing with people in the building trades such as architects, cabinet makers, plumbers, electricians or even clerks in the local hardware store. League president Mike Brickley says, "Those with a passion for sharing God's Word have a new tool they can use, whether they are remodeling their kitchen, selecting new paint or getting a carpet installed. All they do is give away a free Gospel of John as a gift. It's so easy." He says that members of the League have given away more than 100 million Gospels in the history of the Christian outreach ministry, forever changing hundreds of thousands of lives. "Almost everyone you share with appreciates the gesture and accepts the Gospel gift with a grateful heart," he says. Explaining that the League offers free membership and that Gospel booklets are completely free of charge, he adds that "Thousands of members share stories each year describing the impact they are having with these Gospels of John. Again and again we hear how this small gesture of giving away a booklet happened at a critical moment in someone's life, when they most needed to connect with God." The League's free Gospels of John and other resources are offered in English, Spanish and Chinese. Membership is free. Members may order Gospels every month to give away as special gifts in one-to-one encounters in their day-to-day lives.